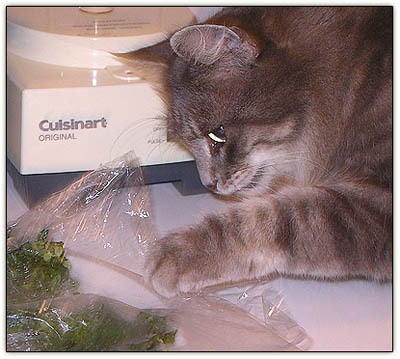 As we whipped up the batter for a batch of Spinach Cornbread Squares this afternoon, Baby (above) played head chef to our sous-chef. How to get kids to eat their spinach: Spinach Cornbread Squares. Based on a recipe we found online at Razzle Dazzle Recipes, our version halves the amounts and simplifies the list of ingredients. Recipe and calorie counts below. 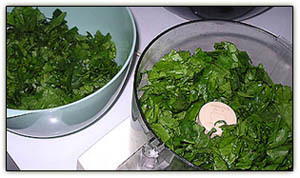 To prepare spinach, wash, remove tough stems, break leaves into bite-sized pieces (left) and pulse in batches in the food processor (right) for finer grain. What's that? Something to eat, maybe? Tiny puts on her detective's hat and investigates. Forget about kids. 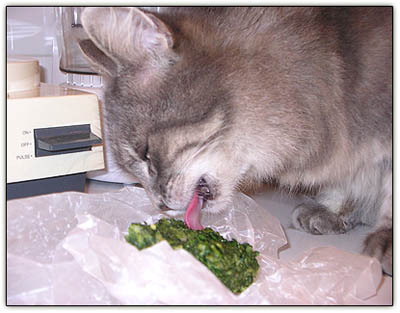 Even CATS will eat their spinach when it's made into Spinach Cornbread Squares. 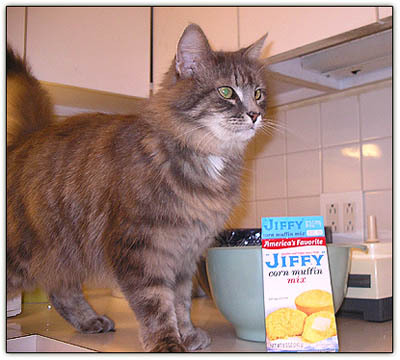 Like the naughty child who stole the pie cooling on the window sill, Tiny -- above, plucking at the plastic wrap with a tentative paw -- couldn't resist the plate of squares cooling on the kitchen counter. Sniff, sniff, sniff. Smells like food. Hey. Not bad. 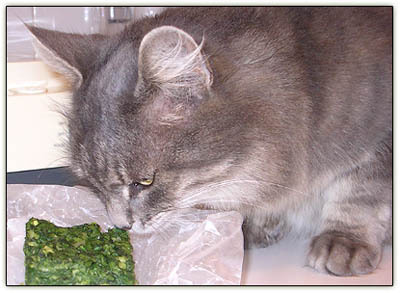 Food critic extraordinaire Tiny gives paws up to the latest entry in our Cold Turkey Cookbook. Preheat oven to 350°, spray an 8-inch-square pan with PAM and half fill a slightly larger pan with water for the square pan to sit in during baking to prevent browning of edges. Blend Jiffy mix, egg, cheeses, garlic, spinach, pepper and oregano together in large bowl, pour into 8-inch pan and bake until edges begin to pull away from pan sides and wooden toothpick inserted into center comes out clean, about 25 minutes. Cool in pan on rack. Cut into 9 squares. Update: Lots more discriminating cats at the Carnival of the Cats #181, brought to you by Mind of Mog's "most adoptable" naughty cats, "all of whom have to go." Hmmm.... yummy recipe, Thanks! I'm gonna make some today. Forget Rachael Ray - my chapeaux is off to Sissy and her amazing diet recipes! Not to mention two GORGEOUS cats.